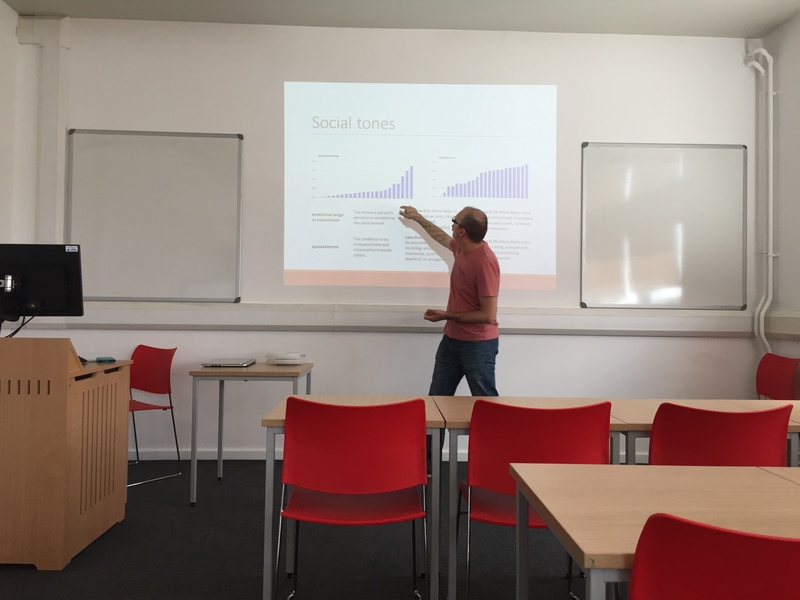 This week Dr Constantin Orasan gave a staff research seminar profiling his current and future research on the Feedback Analysis Tool. The paper was well received and there was an interesting debate and questions afterwards. The Feedback Analyser is an open source intelligent tool designed to analyse feedback provided by participants in various activities. The tool relies on set of modules to analyse the sentiment in unstructured texts, identifies recurring themes that occur in them and allows easy comparison between various activities and users involved in these activities. The tool produces reports fully automatically, but the real strength of the tool comes from the fact that it allows an analyst to drill down into the data and identify information that otherwise cannot without significant effort. The idea of the tool started from a discussion with the University Outreach team who wanted to extract changes in feelings and aspirations towards Higher Education, by processing hundreds of pieces of free text student data in a matter of minutes. This talk will provide an overview of the modules currently incorporated in the system and present the results on a small scale pilot. The possibility to develop this tool further will be discussed with the audience being invited to give suggestions. This entry was posted in Seminars, Seminars 2017 on May 26, 2017 by riilp.